Navarathri in September-October and Fridays of Aadi month (July-August) and Fridays of Thai month (January-February) are the festivals celebrated in the temple. 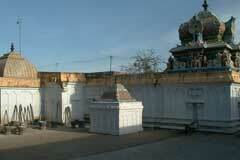 The temple is regarded as centre of worship for cure from cancer. 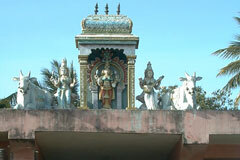 Sri Baagam Piriyal Temple, Tiru Vettriyur, Sivaganga district. Mother Baagam Piriyal is respected as the mother of all people of the place. They consider their assets belonging to Mother. While writing the will to daughters, they use to write it as if from Mother to daughter. Those suffering from cancer, pray to Mother for total cure consuming the theertham Prasad offered in the temple. Devotees perform abishek and archanas to Mother and offer vastras. The faith of people in the mercy of Mother Baagam Piriyal is such that they are certain about the end of their sorrows totally replaced with a bright future. She is believed to be the final medical destination for cure from cancer. She is all alluring to Her devotees. The experience of the devotees is that Mother rewrites their bad stories to good. Emperor Mahabali was noted for his valour and generosity. He was loved by his subjects. This made him proud of his political status. He began to show no respect for Gods and Devas. Maharshi Naradha met Lord Shiva at Mount Kailash and wished his action against Mahabali. Lord said that once when a lamp in his temple was about to extinguish, Mahabali, in the form of a rat moved the wick properly and made the lamp burn continuously. Lord rewarded Mahabali with the rule of 56 kingdoms. 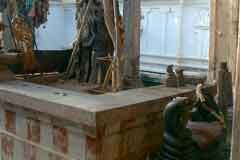 As such, it would be unjust to destroy Mabali in his present birth, said Lord Shiva to Naradha. Naradha went to Lord Vishnu to punish Mahabali for his arrogant character. Lord went to Mahabali as a Vamana – dwarf – sought 3 feet land, measured the worlds in two foot steps and demanded the third. Unhesitatingly, Mahabali offered his head for the third. He was pressed into Padala Loka – world below the earth. Mother Dharma – Dharma Devatha - lost her illustrious son and reached Lord Shiva. As Mahabali was unjustly punished, Lord Shiva cursed Lord Vishnu with cancer on the foot that pressed Mahabali’s head. When Vishnu sought for relief, Lord Shiva told Him to bathe in 18 holy theerthas, worship Lord Aadhi Rathneswarar in Thrivadanai, bathe in the Vasuki spring in Tiruvettriyur south of Thiruvadanai and worship the Linga embracing Him for total cure. Lord Shiva also called Mother Ganga and asked her to pacify Darmadevatha. 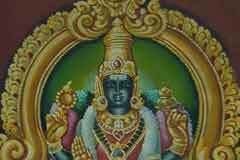 Lord Vishnu came to Tiruvettriyur. His cancer disappeared. Lord Shiva in the temple is praised as Pazham Puttru Nathar and Ambica who never parts with the Lord is praised as Baagam Piriyal – one who never parts with Lord. Those from the northern Tamilnadu have to reach Ramanathapuram via Madurai. Then proceed to Tiruvadanai 60 km from Ramanathapuram. 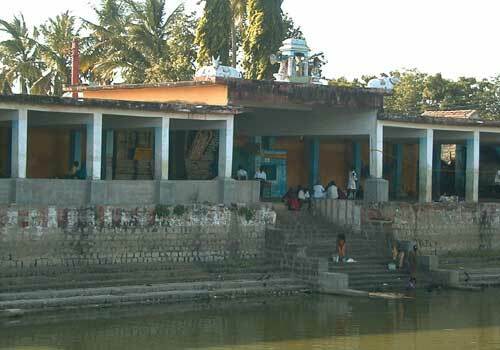 Tiruvettriyur Baagam Piriyal temple is 7 km from Thiruvadanai. Town buses are available.